This is one of the coolest things I have done. I will put a picture of the final result here and then show you how it was made! Well, that's all Folks! If you enjoyed it...leave a message on this page in the guestbook so we can all see who has been here! CLICK HERE to see my new guessing game site. Please sign my guest book....This is a public guest book, so you can see comments other people left. Click on the above link to share this page to Facebook! I used this product which I got in a local craft store to make a pattern of my hand. 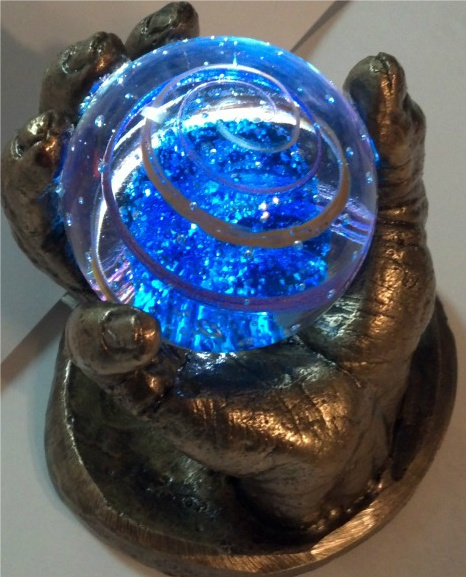 I put my hand in the mold while I was holding the marble. I was worried about this stuff setting up too quickly so I did not mix it nearly enough. As a result, it took about 10 minutes to set up and some of it did not set up at all. 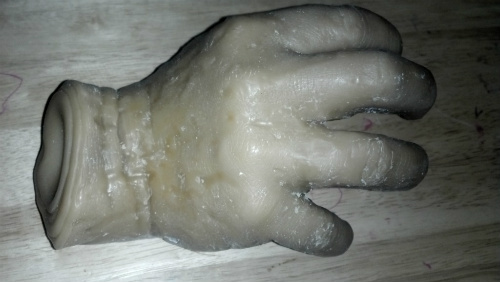 I really wasn't even sure if the mold would be useable...but I poured the wax and it came out fairly well. I was able to clean it up and use it. I poured the wax with the marble still in the mold. Here is a picture of the wax pattern. 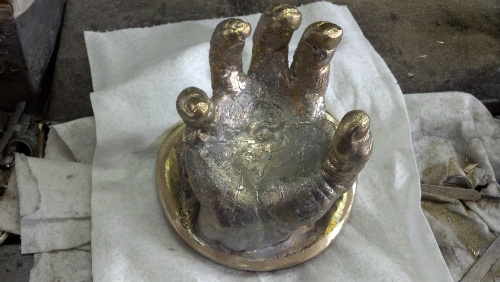 I had to break up the mold to get the hand with the marble out and I broke two of the fingers to get the marble out of the hand. 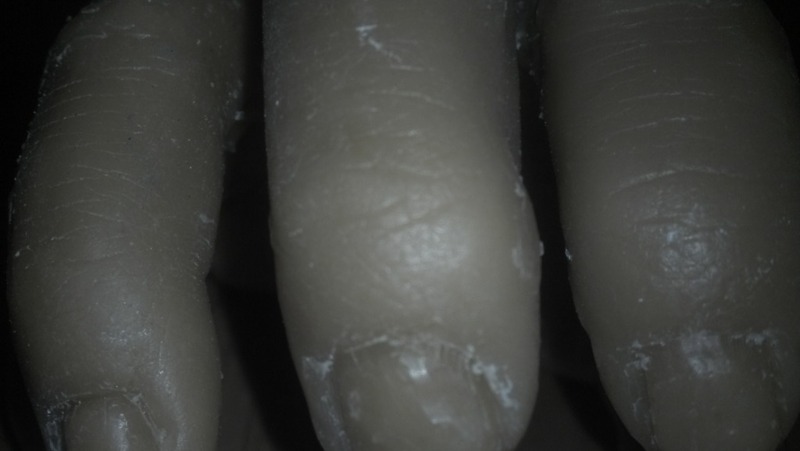 I just melted the joints to put the fingers back on. Here is the wax pattern in the tin can...er, I mean flask. 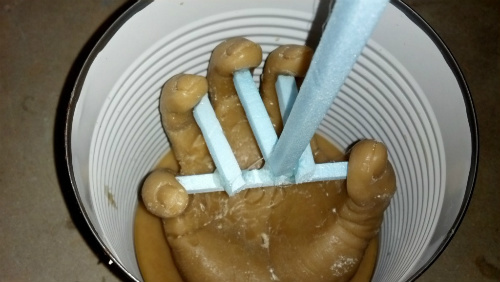 I poured 1/2 inch of wax in the bottom of the can and when it was almost solid, put the hand into it. I put the foam pieces onto it for venting. 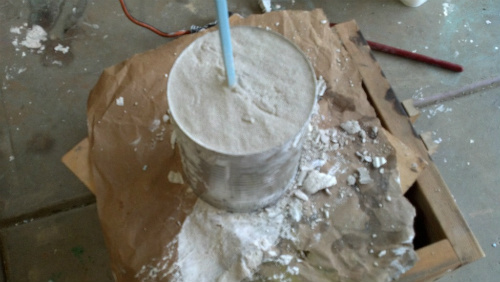 .The investment...1 to 1 plaster of paris and sand was poured and after it set up, the bottom of the can was opened with a can opener. Then the wax was melted out in my kiln and then it was burned out to over 1,000 degrees...This is very important as it gets all the water out of the plaster. If all the water isn't out, the steam from pouring in the metal can cause steam explosions which can be very dangerous!! To cast this, I filled up the 1/2 inch space at the top of the tin can with foam. This will be the base. Then, I glued a McDonalds cup on for the sprue and put another piece of foam at the other end for a vent/riser. The object was for the cup to supply metal and prevent shrinkage. Unfortunately, I didn't have enough metal in my crucible so the base didn't fully fill and I get a lot of shrink on the back side of the wrist...which was perfect because it is hard to see it there. I brushed it with a hand held wire brush and then used gun bluing to give it a patina. I was going to use some other patina on top of that but I liked how it looked so much, I stopped. I had to hammer the pinky and ring finger quite a bit to be able to get the marble in. 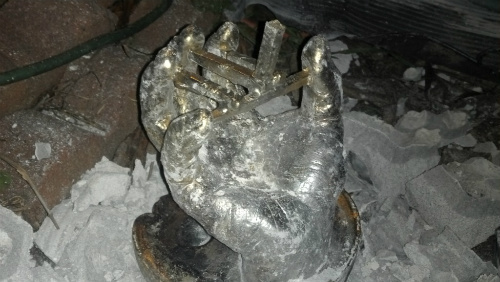 Then, after everything was done, I put it in the vice to pull the fingers back closed. I squirted some silicon caulk in to hold the marble in place too...But I am a little ahead of myself! Before I put the marble in place, I drilled a hole that is now under the marble and then drilled up from under the wrist to put a LED light under it. It operates with a low voltage transformer and it really lights it up well. I am very pleased with the result!